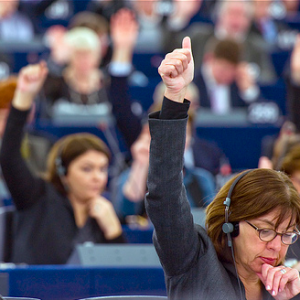 Source: European Parliament on Flickr (CC BY-NC-ND 2.0). Democratic nations face a challenge in finding the right balance between national security imperatives on one hand and the need to protect citizens’ freedoms on the other. In this week’s report we highlight several solutions that fall too far on the former side. In the United Kingdom, the government announced it will to propose a bill requiring Internet Service Providers and mobile phone operators to install equipment allowing the government wide-ranging capabilities to monitor digital communications. This proposal will likely be introduced in the Queen's speech on May 9, and has already raised deep concern from advocacy groups and netizens. In the United States, where new revelations about police tracking of mobile communications have been in the news of late, netizens now face a threat of unaccountable and pervasive surveillance from the Cyber Intelligence Sharing and Protection Act of 2011 (CISPA). Out of a number of cybersecurity bills that have come before Congress, CISPA has been rated as the most draconian for its vague definition, lack of oversight over the use of data, and the threat to privacy. However, this bill has won support from tech companies including Facebook, Microsoft, Verizon, and AT&T. Netizens have initiated petitions on Change.org and Access. ACLU’s website has a chart illustrating important differences among these bills. In addition to UK and US lawmakers, French President Nicolas Sarkozy has called for a new law to criminalize those who “habitually consult websites that advocate terrorism or that call for hatred and violence” after the tragic shootings several weeks ago in Toulouse. Though there are no further details about how Sarkozy will implement his proposal, his talk has cast a gloom over net freedom in France. Political tensions in China have escalated over the past few weeks, with consequences for Chinese Internet users. After a crack in the Great Firewall opened up several weeks ago for just a few days, the government initiated a large scale arrest of Internet users and punishments for website operators who “spread rumors.” Two popular microblogs, Sina and Tencent, were also ordered to close down their comment functions from the end of March to April 3, for the purpose of “cleaning up rumors.” Analysts believe that these moves by the censorship authority are related to the “purge” of Bo Xilai, the former Chongqing Committee Secretary of Chinese Communist Party. Meanwhile, Swedish scientists revealed that the Chinese government has made it harder for Chinese netizens to use Tor, a service which helps people remain anonymous online. But there are still ways around the intensified censorship: another team of scientists recently released a new tool named Skypemorph which can disguise Tor traffic as Skype video calls. In Hong Kong, problems for cyber activists arose in the wake of recent elections, as members of the mainland “50 Cent Party” (paid and volunteer pro-government commenters) have begun to enter discussions in Hong Kong’s online community, attacking people with pro-democracy views. In other parts of the world, several countries are also considering censorship legislation: Swaziland is enacting a law to censor content on Twitter and Facebook which may insult the king; the Iraqi parliament has introduced a bill which punishes those who use Internet to promote ideas to “disrupt public order,” and in Lebanon, the Minister of Information has proposed the Internet Regulation Act to limit online content. In the UK, a British committee headed by the Prime Minister has issued a report urging the British government to require Google to censor content which is found in court to be intruding on privacy. A Bangladeshi court has demanded the government shut down Facebook pages and a website because of objectionable religious material, and an Egyptian court has ordered a ban on pornographic websites. Netizens engaged in fighting the Pakistani government’s plan to institute an online filtering system are still waiting for the official confirmation of the cancellation of the plan from the government and are sending a letter to the Minister of Information and Technology, urging him to abandon the plan. According to the report from Citizen Lab, the Chinese government has conducted a series of information operations, including emails containing malware, directed at Tibetan rights activists following a wave of self-immolations by Tibetan monks. Moroccan netizens Walid Bahomane and Abdelsamad Haydour have been sentenced to jail for 18 months and 3 years respectively by Moroccan appeal courts for criticizing the king. Syrian citizen journalist Ali Mahmoud Othman, who has been documenting the unrest in Homs, has been detained by the Syrian government. People close to him report that he has suffered severe torture. To protest against surveillance by the Chinese authorities, Chinese artist Ai Wei Wei installed an online camera at home to monitor his daily life. The Chinese government responded by demanding that he take down the camera. In the last edition of the Netizen Report, we mentioned that French National Assembly passed a law to issue national ID cards with chips storing biometric information, which has raised surveillance concerns. The French Constitutional Council has now ruled the law unconstitutional as the data storage required to build a national biometric database is disproportionate to its purpose. Ars Technica reports that while data storage on Apple’s new iCloud is encrypted, Apple maintains a master decryption key which can used to review user files including sharing with law enforcement. Claiming that the Xbox gaming console is an emerging platform for pedophiles and terrorists, the US Department of Homeland Security is funding efforts to remotely hack Xboxes and extract data. Campaigns by pro-Syrian government hackers are becoming more sophisticated. The Electronic Frontier Foundation reports that the malware can capture webcam activity, disable the notification setting for certain antivirus programs, record keystrokes, steal passwords, and more. Marvin Ammori and Luke Pelican explore a variety of disagreements on the topic of cyber security and encourage a more robust conversation particularly focused on solutions. A new Girls around me Facebook app created a public outcry over privacy issues as it displays a map marking where females can be found nearby, without their knowledge, based on who has “checked in” on Foursquare. Foursquare has cut off access to the app, but privacy advocates stress that this is a cautionary tale about the dangers of over-sharing. Companies are looking to take a more active role in discussing the latest Do Not Track bill but would prefer to have these discussions in private, according to the New York Times. Jon Leibowitz, the chairman of the Federal Trade Commission writes a Washington Post article about the privacy principles the FTC encourages companies to follow. Erica Newland of the Center for Democracy and Technology writes about a recent study by Azy Barak and Meyran Boniel-Nissim of Haifa University which challenges the conventional wisdom that online anonymity fosters a lack of online civility and is harmful to teenagers. A Vanity Fair article explores the battle lines that have been drawn between repressive regimes and Western democracies, corporations and customers, hackers and law enforcement. Fuzz Leonard, a former core IP & WAN backbone engineer, responded to the Vanity Fair feature on World War 3.0 on his blog. An Israeli graphic designer has reached out to Iranian citizens over Facebook to share a message opposing war between Israel and Iran. The Women’s Media Center project Women Under Siege uses crowd-sourcing technology from Ushahidi to track sexual violence in Syria. Young people in Angola are using social media to spread information and gather activists for an anti-corruption and pro-democracy campaign. Kelly McBride of Poynter analyzes how social media and effective messages brought Trayvon Martin’s story into the national spotlight. The Associated Press and Bambuser, a live video citizen journalism broadcasting service have announced a partnership. A European Citizens’ Initiative allows citizens to call for new European laws on issues of their choice, as long as they have a million signatures from at least seven member states. Highlighting the recently released Enemies of the Internet report from Reporters Without Borders, Richard Fontaine argues that the United States must be active in treaty discussions and other international agreements in order to maintain Internet freedom. In an effort to reduce the power of the Federal Communications Commission (FCC), Republicans in the US House of Representatives passed the FCC Process Reform Act of 2012 which would limit the ability for the FCC to intervene on mergers such as the recently broken up bid by AT&T to purchase T-Mobile. The bill is now before the Senate. More US politicians have raised concerns over the regulatory role the United Nations plays over the Internet through the International Telecommunications Union. Swedish telecommunication providers want to block users from using VoIP services, though their plan may encounter opposition from European Commission. In US telecom service provider Comcast’s new plan for preferred treatment for Xfinity TV data service on the Xbox 360 has driven net neutrality discussions. The US government has released its 2011 report on intellectual property (IP) enforcement. The text reaffirms the Obama administration’s stance on SOPA, concluding that IP protection is needed, but the SOPA bill went too far. The report also endorses ACTA and supports the “8 strike rule” where customers found to be engaging in copyright infringement would be punished, such as throttling down an accused customer's bandwidth speed or limiting their access to the Web. The report comes at a time when the White House is pushing legislation which will target offshore websites. Speaking of offshore websites, Kim Dotcom has asked for his Megaupload videos back with the help of EFF. An op-ed in the New York Times makes the argument that whatever wrongs Megaupload has done, stealing is not one of them and takes apart the rhetorical strategy that illegally downloading content is comparable to stealing a car. The MPAA’s former Chief Technology Officer has become a critic of SOPA, writing that: “The more I became educated on the realities of these issues, the more I came to the realization that a mandated technical solution just isn't mutually compatible with the health of the Internet.” Meanwhile MPAA President Dodd shared part of the MPAA’s plan saying that SOPA needs to be reworked but that there is a chance of reviving the bill before the 2012 election. The 2nd Court of Appeals issued a decision on the Viacom vs. YouTube case on April 5, and David Sohn analyzes what the implications of the decision could have on copyright law and intermediaries. A Dutch anti-piracy group, BREIN, has won a court order from the Hague to shut down a site that circumvents Pirate Bay blocks. The European Court of Justice (ECJ) will review whether ACTA is compatible with the guardian principles and rights behind EU law, the European Commission has said. Spain’s Ministry of Culture has reported that within the first month of the SOPA-like ‘Sinde Law’ there have been 300 complaints filed and 79 website takedowns. Given all of the above, in case you were wondering whether copyright law is compatible with free speech, a column by Cory Doctorow in the Guardian makes the case that the concept of copyright is not dead, but rather outdated.